A who's who of American acting celebrated 2004's finest performances and the start of the SAG Awards second decade in ceremonies telecast live on TNT on Saturday, February 5, 2005 from the Los Angeles Shrine Exposition Center. The 11th Annual Screen Actors Guild Awards® stunning production design paid visual tribute to the film and television industry. Flowing sheets of water were a reminder that the Actors® honor performances conveyed through a moving image. Design elements in glass, copper and silver were used in the set architecture, showroom and table decor in homage to the materials from which lenses, lights, cables and film are made. In one of the evening's many emotional high points, Mel Gibson and Julie Andrews presented SAG's 41st Life Acheivement Awards to James Garner, following a unique autobiographical short film in which the beloved actor reflected on the personal and creative journey that brought him to receive SAG's highest honor.  The SAG Awards tradition of saluting the Guild's membership took a personal turn as well this year, with the filmed profiles of some of the most accomplished artists among the Guild's stunt performers, puppeteers, voice actors, background actors, singers and dancers. For the ninth consecutive year PEOPLE magazine and the Entertainment Industry Foundation (EIF) celebrated actors' work both on and off the screen by hosting the official SAG Awards Gala. The tented back lot of the Shrine Exposition Center was transformed by walls, ceiling and furniture themed in black and white circular shapes accented by thousands of yellow roses into a playful space reminiscent of magical 1960's film sets, where with exuberant partygoers rocked on well into the night.